Russia's early exit from the World Cup has turned the spotlight on its highly-paid coach, with many questioning not only the size of the Italian’s salary, but also the large compensation he would stand to receive in the event of his early dismissal. The chance to secure one of the most successful coaches in soccer history all the way through to 2018, when he could lead the Russian team to World Cup glory at home. Sure, the salary seemed a little high and there was a worryingly large figure buried in the small print, but who could resist? After all, just signing Fabio Capello all but guaranteed success. But it hasn’t turned out that way. Less than six months after signing a lavish four-year contract extension, Russia’s team bowed meekly out of the World Cup in the group stage and the pressure is now on Capello as the media and senior politicians bay for his blood. With a reported salary of $11 million a year, Capello earns more than 16 other World Cup coaches combined, and 50 times more than Mexico’s Miguel Herrera, the star coach of the tournament so far. Newspapers are falling over themselves to list the things that Capello could buy with a year’s income, from superdeluxe penthouse apartments and exclusive artwork to my personal favorite, an Italian archduke’s castle with its own vineyard and olive groves. Even worse, Capello’s contract contains a hidden bombshell. If the Russian Football Union fires him now, it will be forced to pay compensation reportedly valued at $25 million – and that’s a conservative estimate. One respected Russian sports paper claims the true figure could be $43.7 million, effectively Capello’s entire wages through 2018, for no work at all. Since Zhirinovsky has previously threatened to have a pregnant journalist raped and to drop nuclear bombs on Chechnya, you could say Capello got off lightly. Still, with Russia out of the World Cup, criticizing the Italian has become the sport of the day, fueled by public anger – according to one poll, 70 percent of those questioned want him gone. There may be rage now, but questions should have been asked before Capello’s super-contract was ever signed. The journalists and many of the politicians now rounding on the Italian have a guilty secret - until the collapse in Brazil, almost everyone in Russian sports circles trusted Capello blindly, myself included. Capello arrived in 2012 and it all started well as Russia reached the World Cup for the first time since 2002, qualifying ahead of Cristiano Ronaldo’s Portugal (but that achievement looks a little less impressive now after Portugal caved in spectacularly in Brazil). In January, he signed his big-money contract extension. Russia’s World Cup was a disaster from start to finish. 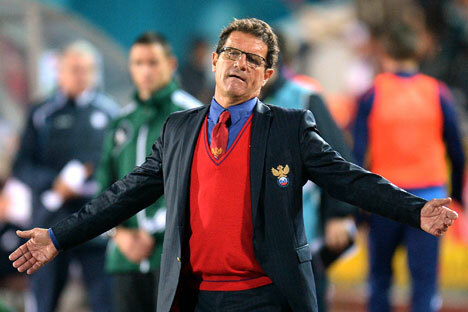 Capello has always been a defensively-minded coach, but he doubled down on that strategy in Brazil. Faced with a must-win final group game against Algeria, he picked a bizarrely defensive starting 11, which unsurprisingly could manage only a tie. Tasked with building a team for 2018, he shut out some of Russia’s best young players. The coach’s blunders were a surprise, but more surprising still was his utter refusal to acknowledge his mistakes. It was all the fault of the referees, apparently. Ironically, the vast contract that is making Capello the target of so much criticism could be the very thing to save his skin. Paying such a large amount of money to fire a man they had such high hopes for would amount to a public humiliation for the Russian Football Union and Sports Minister Vitaly Mutko, who has been Capello’s most prominent defender since the World Cup exit. The Italian remains “one of the best coaches in the world. We don’t need anyone else,” says Mutko, who played a key part in bringing Capello to Russia in the first place. There’s only one obvious candidate who could succeed Capello – Leonid Slutsky, by far the most talented Russian coach around at the moment, who has won the Russian Premier League title twice in the last three seasons with CSKA Moscow. He, however, has given no indication he wants the job. With Mutko onside and few possible replacements, Capello seems unlikely to be going anywhere fast, despite the criticism he has faced. With his record of success, it’s quite possible the Italian could yet forge a team capable of success at its home World Cup in 2018, but the real question here is one of accountability. Capello appears to have a contract under which being fired is almost as lucrative as being successful. He earns more than twice as much as any other coach at the World Cup. Yet until a week ago, for Russia’s star-struck soccer officials, this was all fine. For this tale of an Italian coach’s rise and fall, a Latin phrase seems most appropriate. Caveat emptor – buyer beware.